Local chapters are the building blocks of KFTC’s power – the primary place where members join, get involved in improving their communities and build New Power. Here leaders emerge, develop and practice skills. 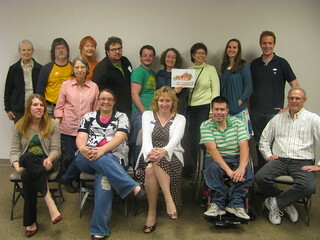 KFTC chapters form where a group of 15 or more members want to become a formal part of KFTC. Most chapters form along county lines, but they can be larger if it makes sense. Once accepted by KFTC’s Steering Committee, chapters are connected to the organization’s resources (staff, information, power), decision-making process and responsibilities. Chapters choose their own local issues and strategies consistent with KFTC's goals. Each chapter has a representative and alternate on the statewide Steering Committee. Chapter members also serve on other statewide issue committees such as Land Reform, Economic Justice, Racial Justice and New Energy & Transition, as well as governance committees such as Personnel, Finance and Leadership Development. Chapters choose these representatives in June at the chapter's annual meeting. Join your local KFTC chapter!